This my friends was my #1 pregnancy craving. We would go there almost weekly! 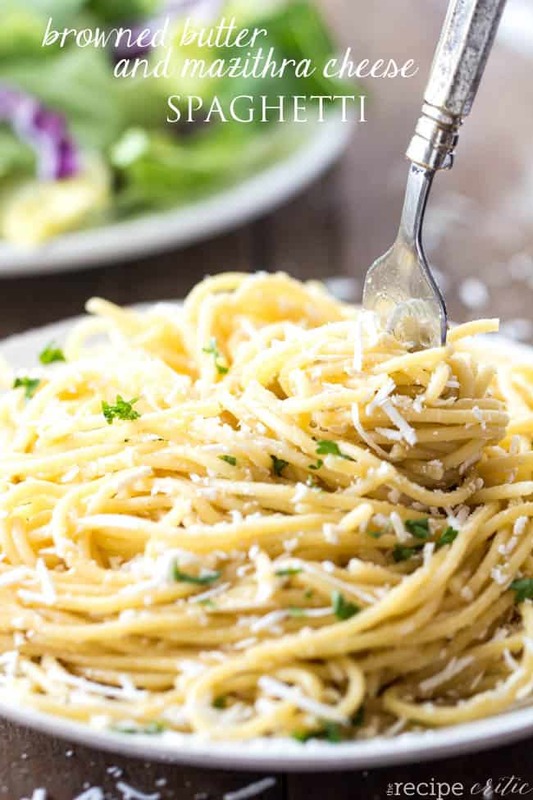 If you haven’t been to the Old Spaghetti factory and experienced the Browned Butter and Mizithra cheese spaghetti, now it the time to make it. This recipe is so simple. And the flavors are absolutely incredible! Since I was a little girl, we would always go to the Old Spaghetti factory. My parents discovered mizithra at our local grocery store and we started having it at home. But they were missing one important part. They didn’t brown the butter. That makes all the difference in this simple recipe. The brown butter gives the pasta a nutty flavor and the mazirtha adds a little saltiness to the dish. Both of the simple flavors combined gives it such an incredible taste. The best part is that you can enjoy this dish at home with your family for a fraction of the cost at the Old Spaghetti Factory. My parents would buy a big thing of mizithra and freeze it whenever we needed it. Everyone in my family would devour it for Spaghetti Sundays. Now we love it in our house and even the picky eater loved it! I call that a win in my book. Your family is sure to love it too! A simple 15 minute must try meal that combines browned butter and mazithra cheese! Tastes exactly like the Old Spaghetti Factory! While the noodles are cooking, brown the butter in a saucepan over medium heat. The butter will turn a yellow, start to froth and then become brown. Drain the pasta but do not rinse. Pour the brown butter over the pasta. Sprinkle with mazithra cheese and toss to coat. Serve with a salad and garlic bread and garnish with parsley if desired. where did u find mazithra cheese? It should just be at a local grocery store in the specialty cheese section. Costco now carries the mizithra Old spaghetti factory uses. Am I the only person who has never heard of Mazitra Cheese? lol Do you buy it at specialty shops? Is there a substitute? I just bought it at my local grocery store in the specialty cheeses. Just found it at Safeway in deli section. Is there another cheese that could be used if you can’t find mizritha? This is our favorite dish! Would love to make it at home but where do you find mizithra cheese? Regular grocery or specialty store? I just found it at my local grocery store in the specialty cheeses. Safeway in the deli section. I found OSF Mizithra Cheese at Costco (in the cheese section). 2 containers for $7.89. I tried this recipe immediately when I got home and it tasted like what I always order at Old Spaghetti Factory. I also put some Browned Butter and Mizithra on steamed broccoli. This Mizithra added the perfect amount of saltiness. Yummy! This looks wonderful. I’ve never heard of mazithra cheese. Is it hard to find? It shouldn’t be. It should be at your local grocery store in the specialty cheese section. What is mazithra cheese? I don’t think we have spaghetti factory’s here. This looks like a great recipe I’m just not sure I’ve ever seen this cheese before. Is it like a Parmesan?I’m in Nevada. Do not have mazithra cheese here, will parmesan work? or gryere? Cannot find Mizithra cheese. Can you substitute another cheese for it? You can’t find their exact cheese in the grocery.Though they call it Mizthra in the store SF gets it from a supplier that ages it a certain way.SF sell the cheese to the public in bags. Have wanted to make this for years since leaving AZ but can’t find Mizithra. Where do you get it? If I can’t find the Moorhead cheese, is there another that can be substituted? I am not sure on that one. Mazithra has kind of a saltyness to it. I’m having a difficult time finding mazithra cheese. What would be the next best thing? It is a kind of cheese. It is amazing. ALWAYS my favorite at Spaghetti Factory. It’s soooooooooo divine! Mizithra is a blend of ricotta and Romano cheeses but it has a similar texture to fresh grated parmesan. Our Costco carries it in little tubs from spaghetti factory, but I’ve found it at our local grocery store too in bags in the specialty cheese section. Rocota Solata is the Italian version of this cheese.